One of the most popular Xbox LIVE games currently on Windows Phone 7 is Parachute Panic, a charming game with amateur trimmings with the basic aim of protecting your falling parachutes from landing in shark infested waters. Explaining how to play Parachute Panic is a bit like describing how to browse a web page on a touchscreen mobile device. Basically the game features skydivers whose parachutes you must open at the right time by tapping; you’re aiming to land them on a ship, so swiping your thumb diagonally will direct a gust of wind onto a safe surface. Missing these ships will see the skydiver plummet to a watery death, often at the mercy of sharks. Just a few taps and a couple of swipes, coupled with some charming graphics and an interesting soundtrack are all that it takes to charm a Windows Phone 7 owner! Let’s get this straight – you won’t be buying Parachute Panic for its awesome graphics. What you might buy it for, though, is for a look at the stick drawings and graph paper background which gives the game such a home-spun feeling, like it was knocked up in the back of a maths exercise book! The animation of the stick characters is great, and the “colouring in” of the sea makes me smile each time I see it. Throw into the mix the adequate sound FX and superbly cool music before and after a game and Parachute Panic is really lining up to be a surprise hit for Windows Phone 7. Available exclusively from the Windows Phone 7 Marketplace either via your phone or the Zune desktop client, Parachute Panic can be purchased for £2.49 in the UK (a one-level trial is also available), around half the price of other Xbox LIVE titles that we’ve reviewed such as Assassin’s Creed: Altair’s Chronicles and The Sims 3. Whether those EA titles are higher in price because they have been ported from iPhone or because EA intend to cash in on Windows Phone while they can in case of a possible failure isn’t clear, but the more games that offer reasonable prices and fun gameplay coupled with Xbox LIVE integration, the better for the platform as a whole. With its warm heart and original graphic design – not to mention low price for an Xbox LIVE title – Parachute Panic is an absolute gem of a purchase and one that you should not miss. While the 200 points for your Gamerscore aren’t necessarily easy the cool soundtrack and amusing death scenes for your stick men should keep you amused. 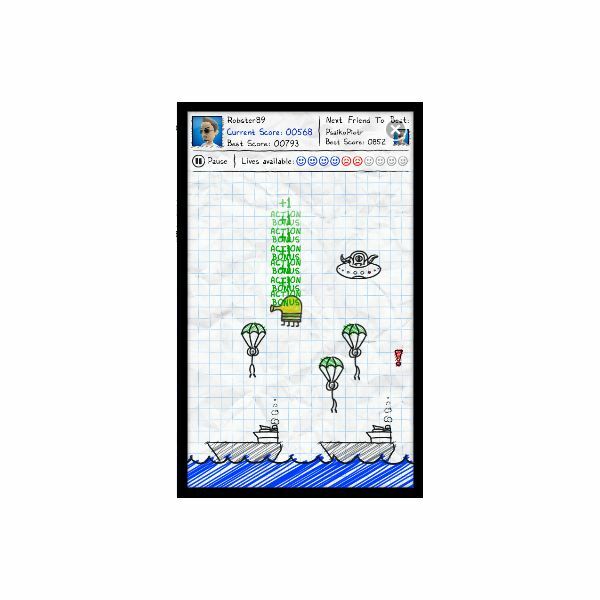 Currently Parachute Panic is among the top ten games for Windows Phone 7 and it is easy to see why. More games like this are needed! 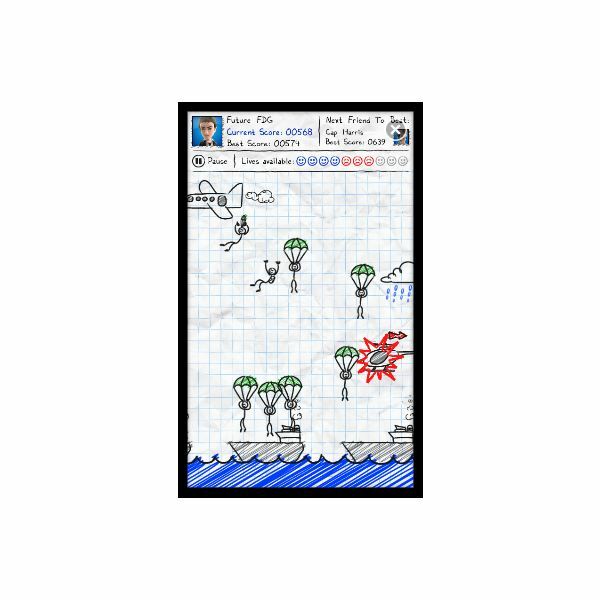 All references and screenshots from Parachute Panic for Windows Phone 7.